When sixteen-year-old Tess Grey arrives in England during the reign of Queen Victoria, something terrifying is waiting for her in London's Downworld, where vampire, warlocks and other supernatural folk stalk the gaslit streets. Friendless and haunted, Tessa seeks refuge with the Shadowhunters, a band of warriors dedicated to ridding the world of demons. Drawn ever deeper into their wold, she finds herself fascinated by-and torn between-two best friends and quickly realizes that love may be the most dangerous magic of all. 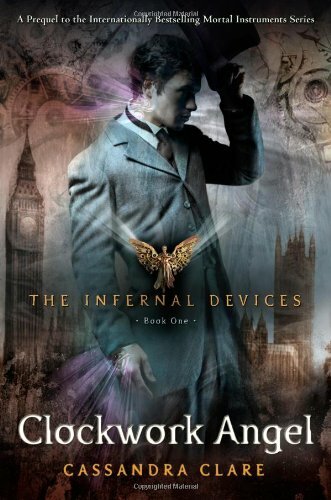 Clockwork angel is like The Mortal Instruments. Forbidden love, action and (of course) Shaddowhunters. The story starts with a girl called Tessa. She used to live with her aunt in America. But her aunt dies of a sickness. Now that she has arrived in London she hopes to meet her brother (Nat/Nathaniel.) But rather than meeting her brother she meets the Dark Sisters who are members of the Pandemonium club. They make her change. Not change as in change into clothes but change as in change into a person. That's her power. she can change into a person, but only if she has something of the person. It can be anything. Their clothes, their jewelery or even a strand of the person's hair. Even though it hurts she has to do it or her brother will be hurt. The she meets William or better known as Will and the group of Shadowhunters. James or better known as Jem, Carlotte, Henry, Jessamine. She meets Will when the Dark Sisters tell her that she is to be married to the Magister. When she escapes from the Dark sister's hands there are still more problems. She has to find her brother; The Silent brothers doesn't know who she is; The Institute needs to find the Magister; They also need to know who are controlling the clock figures. My first thought on this book was that i wouldn't want to be a huge fan of this prequel. This is, because it's the same as The Mortal Instruments. For example, Tessa and Clarissa don't know what exactly they are and the book has the same problem with the boys. Forbidden love. *Sigh* This time its two boys, eh? This me i like Will. Jem is too...too...normal. However, i do feel sorry for him. But, secretly i can' help myself but be drawn into it. I can't believe most of the that Classandra has wrote. Church is that old! And the epilogue just doesn't make sense. How can Will go to Magnus for help! for some reason these days i have been looking at the book covers before reading the book. I guess the cover of a book can tell what it's about. I'm guessing that Will is on the front cover. I love the clokwork angel. P.S. Have a great Christmas!